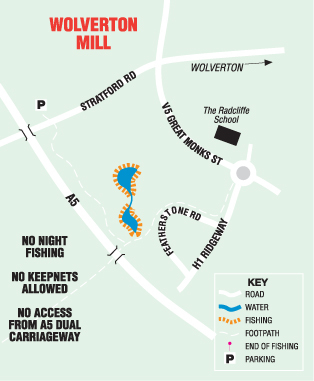 Wolverton Mill is a pair of small lakes full of carp from a few ounces to low 20's. These two lakes are probably the nearest MKAA has to a carp puddle. There is also a few goldfish and the odd koi plus what ever else has been 'stocked' over the years. Average depth is around 4 feet and fishing is only allowed from the 10 permanent pegs. Because these lakes are only fed by surface run-off NO KEEP-NETS are allowed in the interests of fish welfare.